In this chapter we will do the wiring between the pins of the two footprints. 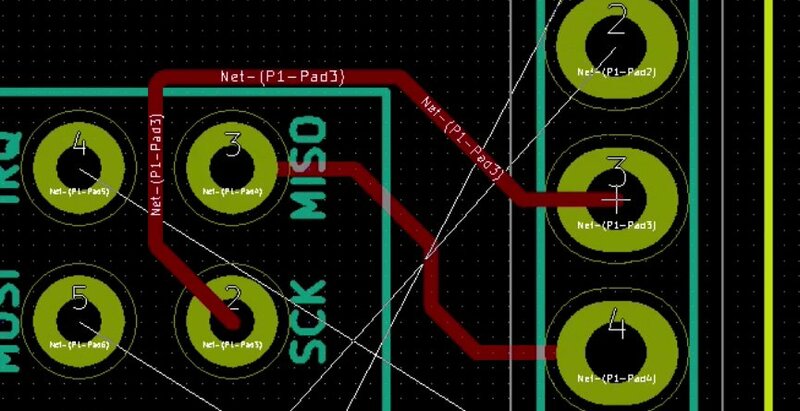 This work is sometimes called “routing”, because it involves finding a good path for the connecting wires as they traverse the surface of the PCB. As you work on the routing, you have to be careful to avoid crossing two tracks (another word for “wire”), or stumbling into holes. 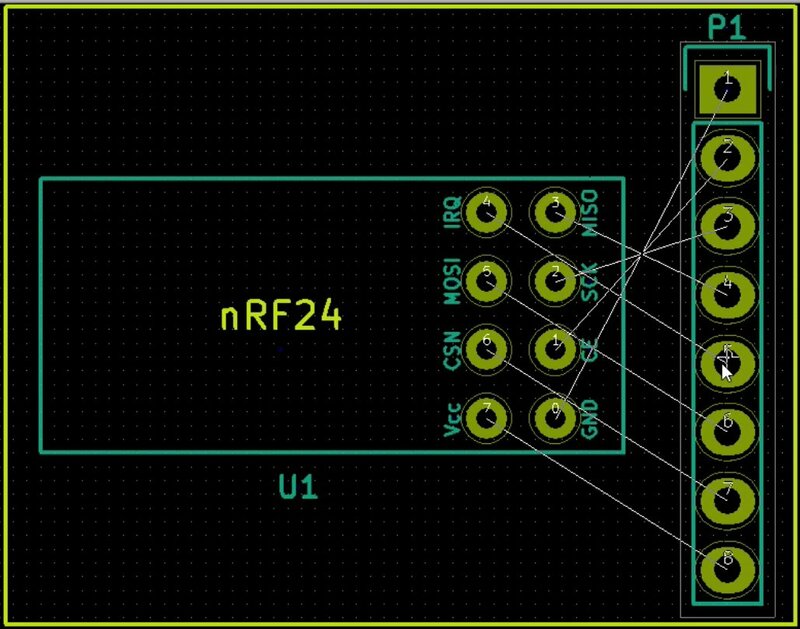 Let’s start the routing process with the nRF24 footprint. 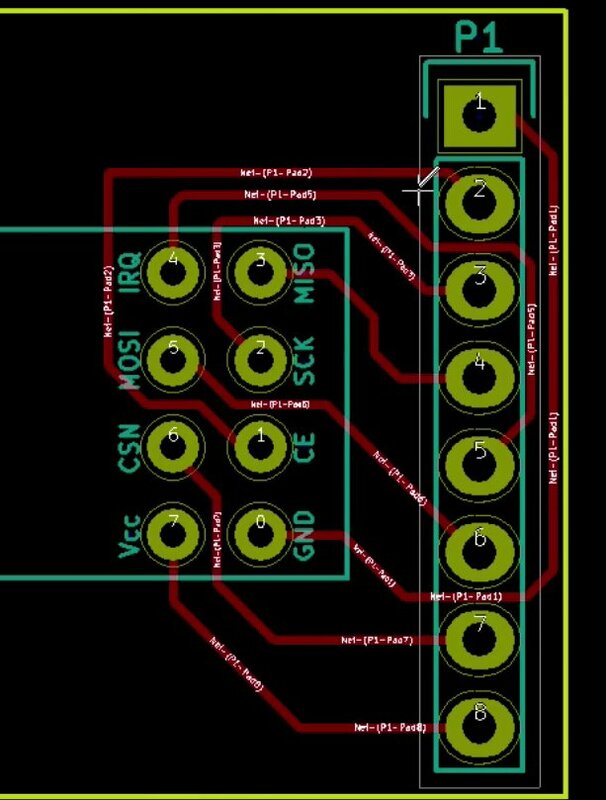 Our objective is to connect the nRF24 pins to the straight connector pins. 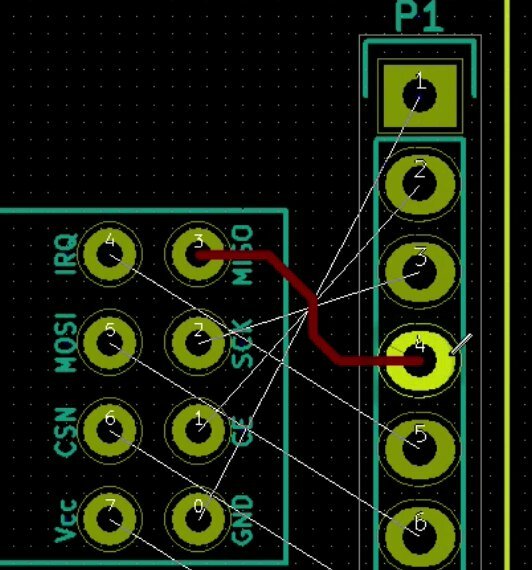 We connect the nRF24 pads with the corresponding pads of the straight connector. The ratsnests will helps us distinguish the pad pairs. To do the wiring, you first choose the layer on which you would like your wires to be on. For this first project, we will place all of the wires on the front copper layer, named “F.Cu”. In the other two projects we will both the front and the back copper layer. Select F.Cu to place the tracks in the front copper layer. 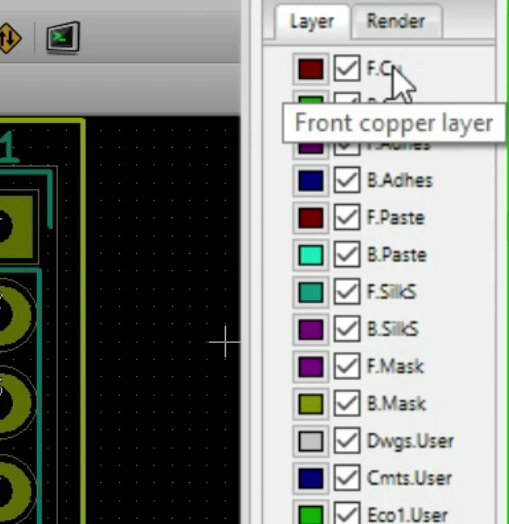 Select the front copper layer. Then hit the ‘X’ key to enable the wiring mode and simply click to start a wire, then click to change its orientation and its trace and then double-click once you reach the end. 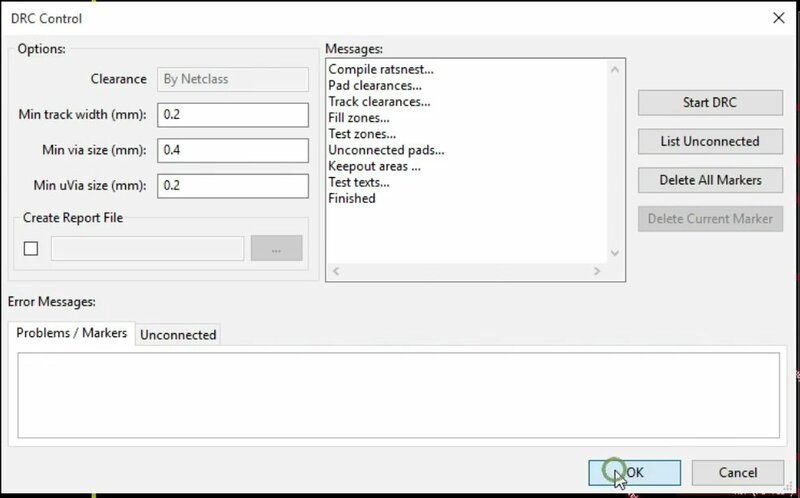 Remember, you can change the grid for the tracks as well. 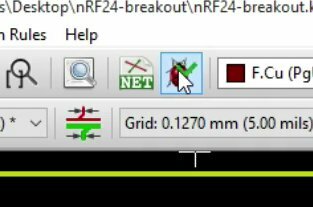 So, if you want to have more control over how your track is moving throughout your PCB, you can change the grid to something smaller. You can always adjust the grid to make it easier to draw a trace. For example, if I go for something small as this, then I’ll be able to have a bit finer control. The second trace, created at a finer grid for more precise control. Notice that if you try to cross a trace over an existing trace, Kicad will not allow you to close the it. Kicad is able to detect violation of electrical rules and enforce these rules. You can drag a single segment of a wire in order to adjust its position by typing ‘G’. This is good for fine adjustments. If you make an error, you can also delete a segment (part of a wire) or a complete wire and try to route it again. Before we do anything else, let’s make sure that we haven’t forgotten anything or that we haven’t broken any design rules. Let’s do a DRC check. Electrical Rules Checking will save you from a lot of headaches. Do them often. So, I click on the ‘perform DRC check’ button and start DRC. This ERC returns an empty report, which means that there are no faults. There is no message down here, which means that everything is fine. If we had forgotten to do a connection, the ERC would tell us that we have unconnected pads. 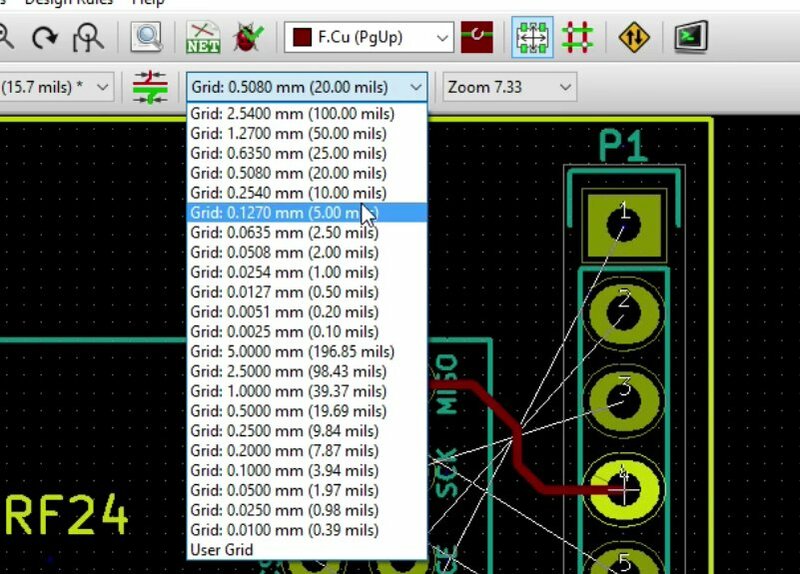 In the next chapter, I will show you how to add text labels in the top silkscreen layer of your PCB. These labels provide useful descriptions for the pins, and information about your PCB.